ETC Green performs both conductivity testing and exploratory borehole testing for geothermal power plants. Borehole testing is necessary to determine the viability of the resources for a utility or specific co-generation scale geothermal energy plant. We now have 53 geothermal survey sites and 10 geothermal projects moving forward (Summer 2009). We are working with the Savannah River National Laboratory in the development and testing of advanced corrosive resistant pipe materials. Our closed loop, binary plant design requires higher capitalization than traditional approaches, however the resulting system has an extended production life expectancy and lower operating costs. A frequent statement heard from Nevada representatives, lead by Senator Harry Reid, is that “Nevada is the Saudi Arabia of Geothermal Energy”. The following chart quantifies and qualifies this statement with over 100 years of accumulated geothermal research data. 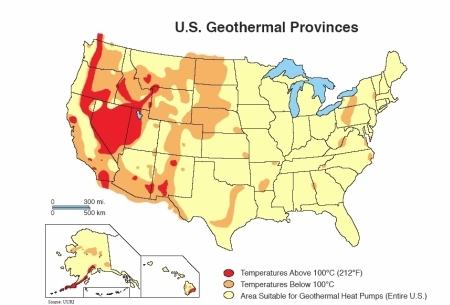 Geothermal Energy is heat (thermal) derived from the earth (geo). It is the thermal energy contained in the rock in the earth’s crust. Calculations show that the earth, originating from a completely molten state, would have cooled and become completely solid many thousands of years ago without an energy input in addition to that of the sun. It is believed that the ultimate source of geothermal energy is radioactive decay occurring deep within the earth (Burkland, 1973). In most areas, this heat reaches the surface in a very diffuse state. However, due to a variety of geological processes, some areas, including substantial portions of many western states, are underlain by relatively shallow geothermal resources. These resources can be classified as low temperature (less than 90°C or 194°F), moderate temperature (90°C – 150°C or 194 – 302°F), and high temperature (greater than 150°C or 302°F). The uses to which these resources are applied are also influenced by temperature. The highest temperature resources are generally used only for electric power generation. Current U.S. geothermal electric power generation totals approximately 3,300 MW. Uses for low and moderate temperature resources can be divided into two categories: direct use and ground-source heat pumps. Direct use, as the name implies, involves using the heat in the water directly (without a heat pump or power plant) for such things as heating of buildings, industrial processes, greenhouses, aquaculture (growing of fish) and resorts. Direct use projects generally use resource temperatures between 38°C (100°F) to 149°C (300°F). Ground-source heat pumps use the earth or groundwater as a heat source in winter and a heat sink in summer. Using resource temperatures of 4°C (40°F) to 38°C (100°F), the heat pump, a device which moves heat from one place to another, transfers heat from the soil to the house in winter and from the house to the soil in summer. The current production of geothermal energy from all uses places third among renewables, following hydroelectricity and biomass and ahead of solar and wind. Please contact us for information about Geothermal Products and Services.